As I write this on the eve of my first trip to the West Coast in seven years several California-related songs are cycling through my brain as it is The most obvious ones are Led Zeppelin’s “Going To California”, Phantom Planet’s “California” and LL Cool J’s “Going Back To Cali”, The Mamas and The Papas “California Dreamin'” and The Beach Boys “California Girls”. I can’t help thinking I should’ve made a California-themed mix on my ipod to listen to, but alas I haven’t packed yet so that might have to wait. However, if I were to add some more songs to the playlist I’d have to include Mike Viola and The Candybutchers “Hills of L.A”, The Magnetic Fields “California Girls”, The Old 97’s “Just Like California”, “West Coast” by the Roadside Graves, and Ryan Adams “Goodnight Hollywood Boulevard” to possibly close it out. I’m sure if I gave myself time I could come up with at least 20 more but then I’d just be showing off all of the music I know about that nobody cares about. In any case, the entirety of the last two days has been spent running around making preparations to take on Sunny California. I’ve been so anxious about the trip that I feel like I’ve been out of the swing of things. My post on JoshSpear.com have been average at best and I even neglected the weekend recap here. In an effort to remedy this I’m going to give you a shortened version of last weekend in the following few sentences. Friday…I got a haircut. Friday night…I stayed in. Saturday was an absolute whirlwind. I left my apartment at 3pm to go see Suli’s 100 level improv show, joined by Joe D, Jess D, JSarah, Rich, Lina, Andrea,Kayvalyn, Enisha and other people I’m probably forgetting. The show was pretty excellent and there were a lot of good laughs. Most of the people in the show were entirely entertaining save for this one guy who kept trying to involve himself in every bit by doing walk-ons that were completely irrelevant and more or less just selfish attempts to showcase himself. After the show I went out with Suli and his improv class for drinks at the Stoned Crow near Washington Square. Rich, Suli and I left at around 9pm and got Thai Food at Isle before heading back to the Stoned Crow. Rich didn’t stick around for long and Suli and I had another beer at a diner with some of his improv crew. After that final beer I headed back to Park Slope and went to the Dram Shop for my friend and editor at JoshSpear.com Heather’s going away party. I had a few more drinks and at around 2am, Heather and I left the bar only to notice that it was pouring and relatively cold. Rather than walk the 10 plus blocks home we split a cab and I fell fast asleep in dreamyland minutes later. Sunday…I barely left my house. Well…that was my hasty…sloppy excuse for a weekend recap. I still have so much to do before my plane leaves in less than 14 hours…the least important one among them is pack. I still have to do two posts for JoshSpear.com, one post for Trendliest, and one for If I Blog It They Will Come. I’ve really worked myself into a corner with all of these writing projects. However, I think I’m going to take the next week off, writing only when I’m inspired to. I need to get away from this computer and enjoy life and people for a bit…and maybe even some scenery. Hopefully the hills of LA and a little sunshine will help refresh my nose for witty and engrossing content, because right now my brain feels like absolute mush and looking at words makes my head hurt. In any case, I’m looking forward to seeing some long lost faces from my past and even some things I’ve never seen in the next week. 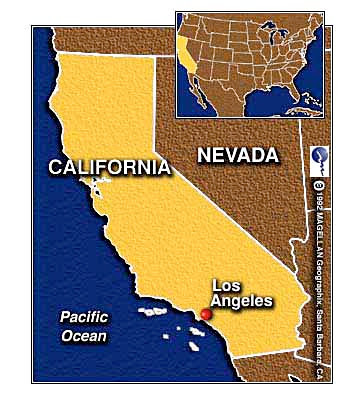 Maybe I’ll have so much fun I’ll be convinced that I have to move to LA…though probably not. My first order of business though is to bring this post to a close and get a handle on all of my other responsibilities. So goodbye for now…and hopefully I’ll see you soon. Who knows, you could hear from me tomorrow after I catch the Angels-A’s game in Anaheim. Can You Spot Evan Kessler In This Picture? This morning I opened my Facebook account to notice that I had been tagged in a photo posted by someone I hadn’t seen in at least 15 years. I always find it peculiar when people post such old pictures of their childhood for others to see on their account, like they’re inviting people to ask them questions about their past just to see if they’re curious enough to bite. Often times these old images seems like they only serve to allow people to compare and contrast the cute child they once were with the monster they have become. This particular photo however was different. 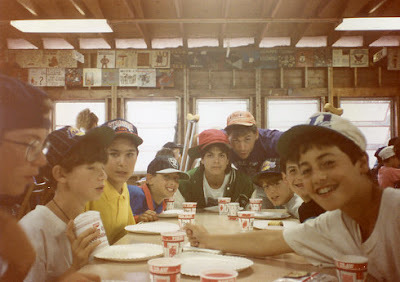 It was taken by my camp counselor from the Summer of 1991 and brought back a flood of old memories. That particular summer was the last at my old camp before it was moved across the lake from the tiny yet beloved armpit of Orson, PA to the somewhat majestic open spaces of Poyntelle. It was one of the better summer’s I remember from my childhood. The bunk that housed us that summer was previously divided by a wall. However, the camp had decided to knock down it down for whatever reason before we arrived and we were greeted by one huge unit and a ton of space to spread out over. Instead of being bunks Iroquois and Juno, we dubbed ourselves bunk Junoquois. Along with the bonus of being one of my favorite bunk lineups in camp history, was just the sheer amount of fun we had. We spent a large time that summer utilizing that space within the bunk to play dodgeball, as well as other semi-athletic endeavors. Some of my favorite times were spent together on our porch with our counselors as we’d play pranks on any passerby. We would tell people they dropped something…and they would spend several seconds looking for any lost items. We would yell towards the canteen which was in plain sight..”get off the canteen roof” to make others look. We took pride in duping the camp owners several times. It was all very simple and immature…and probably not all that funny, but I was 12 years old…and it was hilarious. As the summer approaches and I’m faced with questions of income and employment yet again, I look back and smile at just how easy it all was once, when my biggest worries were making the Under 13 baseball team or whether or not I’d end up stacking at the end of each meal, or if we would win Lower Camp Sing and get a free pizza party at the Villa Coma; Things that at the time seemed important and worth fighting for…but in reality were all just part of the simple pleasures of being a kid.